A review of Voices Heard: Women’s Right to Petition in Late Chosŏn Korea, by Jisoo Kim. Jisoo Kim’s Voices Heard: Women’s Right to Petition in Late Chosŏn Korea is a ground-breaking study of women’s petitions the state. Analyzing a copious amount of petition letters written by women during the Chosŏn dynasty, Kim shows how the Chosŏn court’s heightened sensitivity to the subjects’ grievances (wŏn) enabled its women to play an active role as petitioners, and even to challenge existing gender norms in the process. As such, Kim’s research stands in a long line of studies that illuminate women’s complex lives under the Confucian ideology. While the dominant image of the Chosŏn dynasty is that its women suffered in the public realm due to Confucian prescription for female domesticity, Kim’s research shows that the Chosŏn women actively participated in public expression of grievances through sending petition letters to state authorities, functioning as indispensable advocates for distressed family members. Moreover, the female petitioners also pushed the limits of gender and status boundaries set by the state. Kim’s analysis shows how the Chosŏn petitioning system worked as a channel through which tensions over gender and status were negotiated between the state and society, which Kim posits as one reason why the Chosŏn dynasty enjoyed such longevity. In so doing, Jisoo Kim steps away from current trend of legal history that has focused on comparisons with the West, and unearths the significance of the Chosŏn legal system from an indigenous perspective. In Chapter 1, “Women as Legal Subjects: Gender, Status, and Law in Chosŏn Society,” Kim shows how women of the early Chosŏn period utilized their petitioning right to challenge the gender norms that were being re-organized according to Confucian ideology. Women in the Chosŏn dynasty were vested with equal legal capacity as men to petition to the state. In the legal realm, Chosŏn women were far from being domesticated; they were not only allowed but encouraged to speak their grievances in public, and such legal capacity was granted to all sectors of society, including women of lower classes. As such, Kim argues, the “[l]egal space in the Chosŏn functioned as a site of rectification, contestation, and negotiation” (p. 83). Even the elite women, who were subject to Confucian ideal of female domesticity, had full legal capacity unlike women in China. In so doing, Kim argues, “[t]he Chosŏn state envisioned building a different kind of gendered society from either the Koryŏ dynasty or Qing China by reaching a compromise between the Confucian gender system and indigenous legal practices” (p. 63). In Chapter 2, “Constructing Female Subjectivity Through Petitioning,” Kim explores female subjectivity expressed in petition letters, especially through the use of language and narrative strategy. Although such petitions were not officially recognized until later in the dynasty, many women submitted petitions in the vernacular Korean script. Many women alternated between Classical Chinese and vernacular Korean in drafting their petitions, and sometimes chose the language they thought best benefited their cause. Kim introduces an interesting case of a Madam Yi, who stated that she intentionally drafted her will in vernacular Korean, believing that this would prove the authenticity of the document. (pp. 91-92) Kim argues that by using vernacular Korean, women were not only able to form a particular subjectivity in the legal realm but also that to challenge “the public literary space that was previously dominated by classical Chinese” (p. 94). Kim also points out that women employed narrative strategies to maximize their interest, emphasizing their pitiful condition as the weaker subjects (pp. 110-111). By actively emphasizing their “feeble” nature, one female petitioner even stretched the usage of petitioning by seeking legal advice of the state authorities. In Chapter 3, “Journey to the Capital: Begging Pardon or Favor of the Sovereign,” Kim examines the surprising power relations embedded in the Chosŏn petitioning culture. Surprising considering the Confucian prescription for female domesticity, many women, including those of the elite class, traveled far to petition directly to the king on behalf of family members. While petitioning for one’s superior was part of Confucian norm, women’s petitions, in some sense, subverted Confucian patriarchal order, in the sense that the husbands (or fathers) who were being petitioned for, were solely dependent upon the petitioning women for advocacy. Many aspects of female petitioning practices challenge our understanding of female domesticity in the Chosŏn dynasty. In some cases, women’s image as the domestic figure actually empowered them to protect family interest in the most pressed of legal situations. This was well demonstrated in the case of a Madam Kim, who hid her grandson from the state in order to protect the lineage line. Madam Kim was eventually pardoned of her crime, but this was possible only “because her loyalty did not extend to the public realm, the state, but merely remained within the family” (p. 170). In Chapter 4, “The Power of Representation: Seeking Rectification on Behalf of Family Members,” Kim explores the significance of the emotion of “wŏn” that women expressed in petitions on behalf of family members. While the Chosŏn court initially prohibited petitioning against state authorities, its sensitivity to the subjects’ grievances eventually forced it to lift the ban. Through an interesting case from Cheju island, Kim shows that even a female entertainer could expose a public official’s wrongdoings and be vindicated. In the end, Kim posits, the petition system successfully functioned to relieve pent up grievances against the state and contributed to the long stability of the Chosŏn state. Jisoo Kim’s dissertation makes a significant contribution not only to women’s history but also legal history of Korea. Especially valuable is her introduction of women’s petition letters to the field, which not only provides a rich source for understanding the legal culture but also the domestic realities of the Chosŏn dynasty. Her attention to the legal realm also enables her to illuminate women’s voice outside of domestic confinement, which is a significance complement to the current historiography on the women of the Chosŏn dynasty. Kyŏngguk taejŏn [Administrative Great Code]. Seoul: Ilchisa, 1978. Chosŏn wangjo sillok [Veritable records of the Chosŏn dynasty], 48 vols. Reprint. Seoul: Kuksa p’yŏnch’an wiwŏnhoe, 1970. Columbia University. 2010. 261 pp. Primary Advisor: JaHyun Kim Haboush. 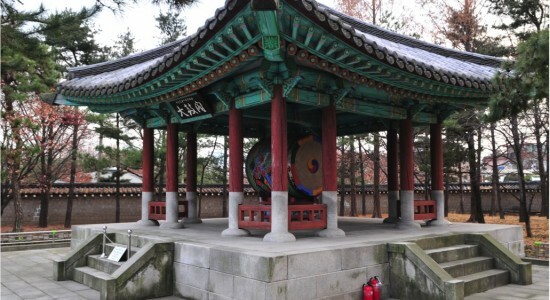 Image: Petition Drum, photograph taken by Jisoo Kim.